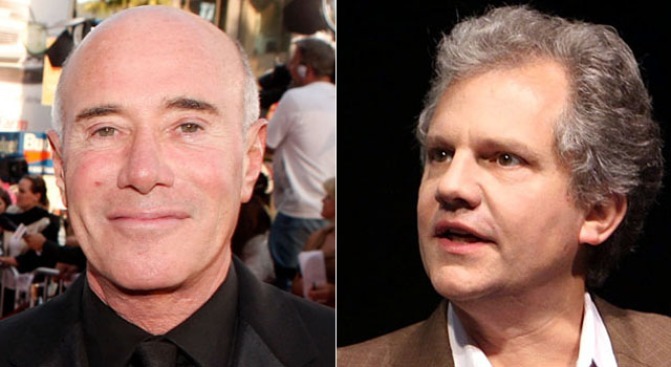 David Geffen (left) wants in at the New York Times, but it might be a while before he joins chairman and publisher Arthur Sulzberger on the ownership team. Hollywood mogul David Geffen wants a say in all the news that's fit to print. Geffen, who founded Elektra Records and later the film studio Dreamworks, made an offer to purchase a 19-percent interest in The New York Times, Fortune.com reported. His offer "in the past two months" to buy Harbinger Capital Partners' nearly one-fifth stake in the company was denied, according to the Financial Times. Reps for Harbinger and Geffen, as well as the newspaper, would not comment on the report. The Ochs-Sulzberger family is known for a firm grip on the company's voting rights, but reports suggest that could change in light of the Times' financial struggles. The company borrowed $250 million from Mexican telecom giant Carlos Slim and has threatened to close its second-largest paper, the Boston Globe, according to the Guardian. The paper has even sold a piece of its Manhattan headquarters and solicited offers for its stake in the Boston Red Sox, the Financial Times reported. Still, Times chairman and publisher Arthur Sulzberger insisted recently that the family is not interested in selling the paper. So where does that leave Geffen, who in 2007 was among the losing bidders to buy the Los Angeles Times? A source close to Geffen's Times bid said Geffen offered "the prevailing market price," but added that Harbinger wanted a premium, the Financial Times reported. The source added that Geffen said he'd be "a patient buyer."